Slavery is now illegal by all states and under international law. Contrary to the hopes of abolitionists, this state of affairs has transformed rather than eradicated slavery as an institution. 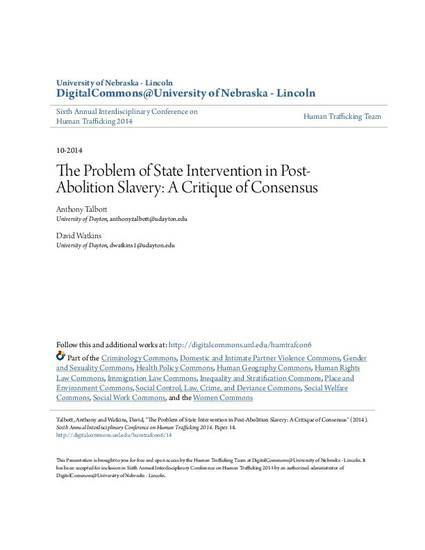 Furthermore, responses by states to post-abolition forms of slavery have often been less than ideal. This paper begins by comparing two state responses to slavery in the early 20th century: the federal peonage trials in Montgomery, Alabama from 1903-1905, and the federal response to an alleged epidemic of “white slavery” from 1909-1910, culminating in the passage of the White Slave-Traffic Act. Taken together, these responses engender pessimism about the state as an effective tool against slavery: in the former case, the slavery in question was very real and demanded effective state intervention; in the latter case, the imagined epidemic of slavery was a moral panic with little basis in reality, but lead to a law that granted federal law enforcement sweeping new powers but did little to ameliorate actually existing slavery. These earlier responses will be compared with the Trafficking Victims Protection Act of 2000. While there is considerable disagreement regarding its effectiveness, all sides agree that modern day slavery has not been eliminated or reduced. The state’s weakness as a tool against emergent forms of slavery is surprising from the perspective of deliberative democratic theory: that slavery is a great moral evil is, by this time, in little dispute. We will argue, however, that this consensus is part of the problem. Because the cause of anti-slavery is, at the level of discourse, morally unimpeachable, it is a temptingly powerful tool for legislators and social reformers alike to use in the service of other, perhaps more controversial goals.